Know a Facility Rockstar? Nominate them for a RFMy Award! 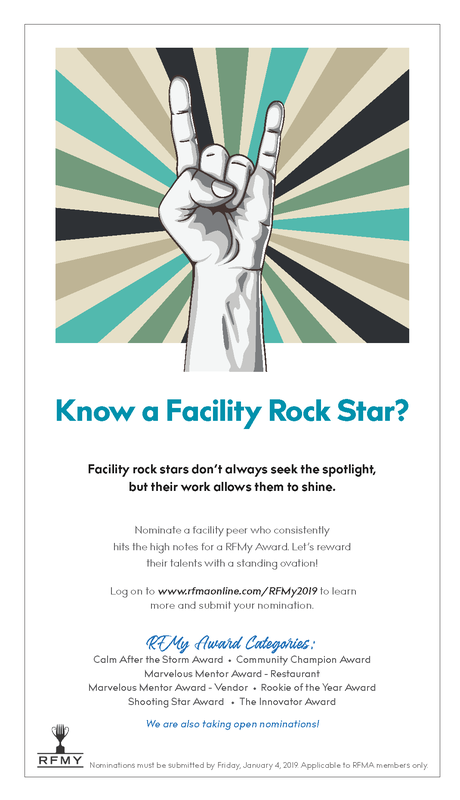 Know a Facility Rock Star? Facility rock stars don’t always seek the spotlight, but their work allows them to shine. Nominate a RFMA peer who consistently hits the high notes for a RFMY Award. Let’s reward their talents with a standing ovation . This award goes to a RFMA restaurant member who demonstrated their skill, experience and leadership preparing or following a disaster-related situation in a restaurant. This award goes to a RFMA vendor member who should be recognized for their outstanding sales achievement in 2018. This award goes to a RFMA restaurant member who has acted as a mentor to help develop a new industry professional. This award goes to a RFMA vendor member who has acted as a mentor to help develop a new industry professional. This award goes to a RFMA member who has made an outstanding contribution to their community through their own volunteer efforts. This award goes to a RFMA restaurant member who has had outstanding achievement while being new to their position or field of facility management in 2018. This award goes to a RFMA restaurant member who has "thought outside the box" and created an innovative new initiative at their company. Feel free to submit a nomination for a RFMA restaurant member who deserves special recognition for their achievements in 2018. Nominations must be submitted by Friday, January 4th! *RFMy awards and nominations are applicable for RFMA members only.